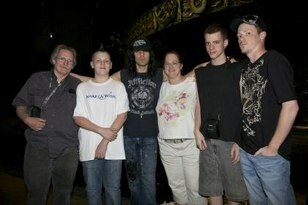 Criss Angel continued his work with the Make-A-Wish foundation last week, working with two kids who’d requested to meet with him. A 13-year-old Pennsylvania boy, Nick, and a 17-year-old girl, Sarah, from North Carolina were the illusionist’s guests at his show, and they, along with their families, met Criss afterward backstage, where he showered them with gifts of magic kits, decks of cards and shirts. “I had a great time performing the show with them in mind, but an even better time having our private get-togethers after the show with them and their families. What an incredible inspiration they are! Amazing strength and courage for us all to learn from,” Criss said. Sarah got to participate in Criss’ new motorcycle mentalism illusion which has just been installed into Believe and is described by Criss himself to Robin Leach as follows. “The audience reaction to this new illusion is nothing less than absolutely amazing,” Criss said. “It’s probably the most fantastic trick ever created. The bikes are all on display in the lobby of the theater. The onstage guest chosen at random from the audience selects one from a grid, and then the moment they reveal their choice, I make it appear right there under the most impossible of conditions.